Navy divers had detected a body using an unmanned remotely-operated vehicle (ROV) at a depth of around 160 feet inside the main shaft on Wednesday. 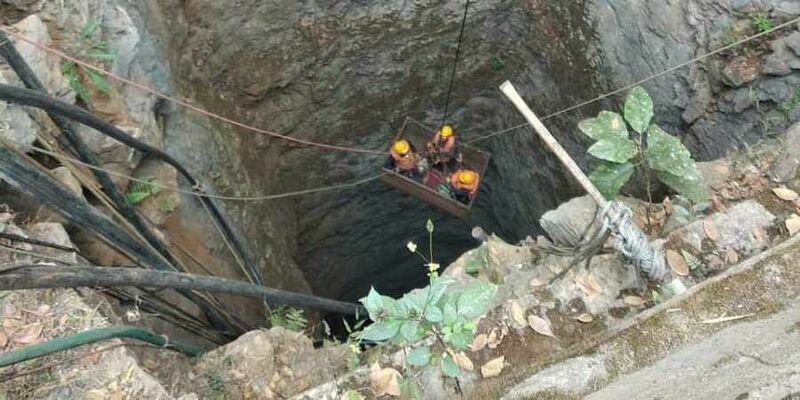 SHILLONG: The families of four of the 15 miners trapped inside a 370-foot-deep coal mine in Meghalaya requested rescuers on Saturday to retrieve a decomposed body spotted by the divers so that they can perform the last rites. Government officials have said that it would be extremely difficult to retrieve the body intact since it was in a decomposed state. A senior government official said that the rescue operation is still underway because of a Supreme Court order. "We want the body," said Manik Ali, whose 20-year-old brother Monirul Islam is among the 15 miners who were trapped in the rat-hole mine. "Even if they manage to get a finger or a bone out of the shaft, it is fine for us. We will at least be able to bury the dead with some respect," said Ali. Ali, representing the families of three trapped miners from Assam's Chirang district, and Aminul Uddin from Hojai district were called by the district administration and the National Disaster Response Force (NDRF) on Thursday to see a video footage showing the body. "They showed us the video. The body is swollen. The face cannot be seen so we cannot make out who it is," said Aminul Uddin, who worked at the same coal mine with his elder brother Kuti Miya. Aminul Uddin was lucky as he went home on December 7 to vote in Assam's panchayat elections. "On the evening of December 13, I got to know that my brother is trapped," he said. On December 13, water from nearby Lytein river flooded a network of tunnels in the mine, trapping the 15 men. A multi-agency operation, which include de-watering of the main shaft where the miners are trapped and in the nearby mines, have failed to yield any result so far, as the water level did not reduce even after pumping out over 3 crore litres of water, officials had said. The district administration and rescuers have told the families that the body could disintegrate if it is pulled out and that it would be difficult to retrieve it. "It does not matter. We are Muslims. According to Quran we have to bury the dead. I can recognise if its my brother even if I get to see the ring on his finger," said Ali. "I have lived with my brother all my life. I will be able to recognise him," said Aminul. Both of them said they have conveyed the message to the district administration. "The deputy commissioner is talking to the next of kin and trying to convince them that it is very difficult to retrieve the body," said Peter Ingty, Additional Chief Secretary, who is overseeing the rescue operation. He said it is because of the Supreme Court order that the operation has not been called off. "It is only because of the Supreme Court order that we are hanging on. Submissions will be made before the court and let's see what happens," Ingty said. The apex court is hearing a public interest litigation (PIL) seeking steps to rescue the 15 miners.